4 Star self-catering accommodation adjoining attractive architect-designed house, set in an acre of garden, with excellent views. Sleeps 2. 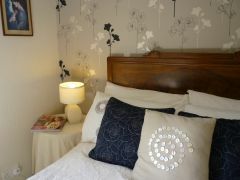 The centrally-heated accommodation has a private entrance. A small hall leads to an open-plan kitchen/living-room with oak flooring and views to the loch. The kitchen is fully equipped including oven, hob, extractor, dishwasher, fridge, freezer, microwave, toaster, food mixer, iron and ironing board, and washing service. The living area has a maple dining table and chairs, a leather sofa, easy chair, and a feature electric fireplace. There's T.V., Wireless Internet access, DVD player with a selection of DVDs, Digital radio, iPod docking station, a good choice of holiday reading, plus lots of tourist information about this area. Upstairs, the bedroom has a standard double bed, panoramic views of the Gareloch, and is furnished with an antique four-piece suite. It has dressing-gown/slippers, hairdryer, alarm clock, radio/CD player, additonal feature electric fire, and television. 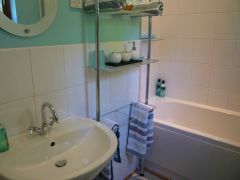 The bathroom adjoins the bedroom - with over-bath electric shower, constant hot water, shaver point, towels, and a selection of toiletries. 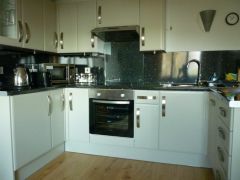 We provide gas central heating, electricity, bed linen, towels, tea-towels etc. Outside, there's a patio with table and chairs, a large garden, and ample off-road car parking space. We welcome well-behaved dogs (sorry, one dog only) who bring their own beds, and are not left alone in the property. There are lots of good places for dog-walking in this area. On your arrival, there will be fresh flowers and a tray with homemade cakes to welcome you.